California Gov. Gavin Newsom has announced that he’s abandoning a plan to build a high-speed rail line between Los Angeles and San Francisco. The project's cost has ballooned to $77 billion. Hurray! This is long overdue. I was writing about how dumb an idea this was back in 2008. I remember it because I was on Fox and Friends in the worst time slot ever to talk about it. Not only was the interview at like 4AM Arizona time, but the segment immediately before I discussed economics and public policy *yawn* they had 8 cute maltese puppies frolicking on stage. Everyone, including I would bet California officials but probably excepting elements of the fawning media, knew the cost estimates were a joke. In 2010 when CA said $30-$40 billion I said it would take at least $75 billion and when CA belatedly adopted that number I doubled it to $150 billion and I think that is still low for what it would have cost. This was all at a time when you could fly Burbank to Oakland on Southwest for $90. Newsom, though, said he wants to finish construction already underway on a segment of the high-speed train through the Central Valley. The project would connect a 119-mile stretch from Merced to Bakersfield. This is absolutely absurd. If you started with a clean sheet and studied what the Central Valley really needed for "economic transformation," I am willing to bet a high-speed rail line from Merced to Bakersfield would not be in the top 100 items, maybe not the top 1000. Probably first on the list for the Central Valley economy would be to stop applying minimum wage rates based on San Francisco to poorer rural areas of California. If you wanted to limit yourself to infrastructure projects, the Central Valley would probably beg for water infrastructure projects, not a silly overpriced train. In part 1, we discussed different ways of measuring income mobility and income growth for the poor, and discovered that many traditional measurement approaches are overly pessimistic -- when one focuses on actual individuals, instead of income quintiles, income for the poor has improved substantially. 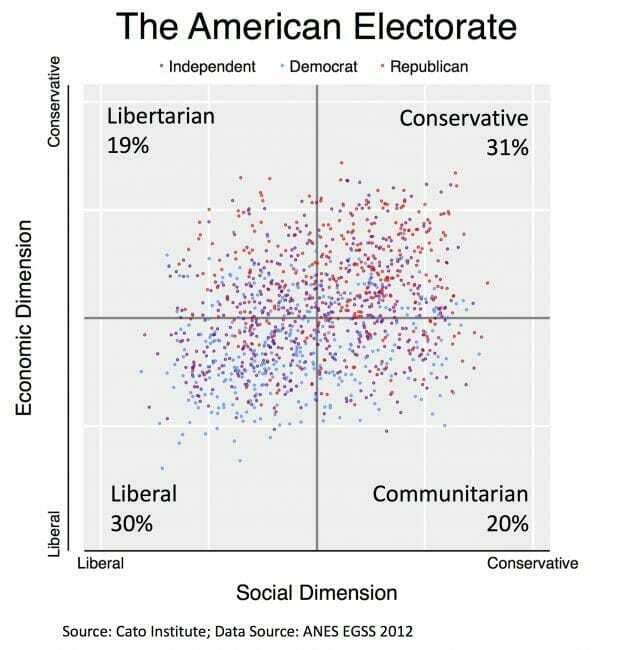 Unlike some libertarians, I don't have a problem with intelligently structured income transfer and safety net programs to help the very poor. In fact, I believe that such income transfer programs can be far less distortive and economically inefficient that many other anti-poverty programs. One of the latter I will focus on in this article is the minimum wage. I want to first call your attention to the figures at the top for mean number of earners per household and household income per earner. Much of anti-poverty policy seems to be based on the assumption that poor people, because they lack bargaining power, get hosed on wages and other work rules. Public policy thus tends to focus on minimum wage and overtime rules and a myriad of other workplace interventions. We keep the amount of work done the same, but raise the wage rates of the poorest quintile to the middle quintile. In this case, their average income would go up by about 50% from $12,319 to $18,654 (calculated as 0.41 mean earners times middle income per earner of $45,497). So in this example, increasing the poor's wage rates to middle class levels yields $6,335 a year while increasing the poor's amount of work done to middle class levels yields $28,844 a year. Public policy that focuses on increasing work hours for the poor has 4.5 times the effect of public policy focused on wage rates. A corollary to this is that any public intervention on wage rates for the poor that has negative employment effects is likely to have little net effect on poverty. But in fact this understates the relative benefits of approach #2. Look at the education levels in the poorest quintile vs. the middle. 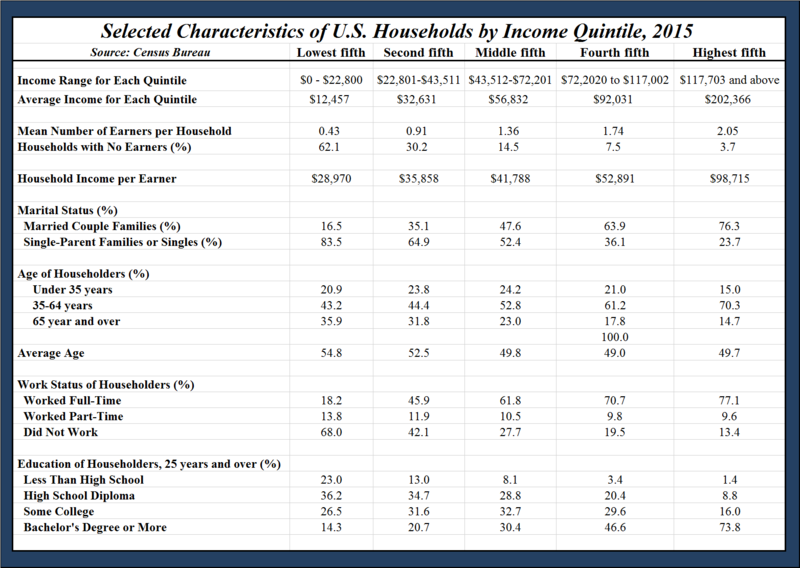 The poorest quintile has 2.5 times as many people without even a high school degree as in the middle. For these folks to progress, the only way they can develop skills is on a job and they can't do this without a job. Or said another way, another advantage of approach #2 and getting them more hours of work is that they gain more skills to overcome their starting disadvantage in education. 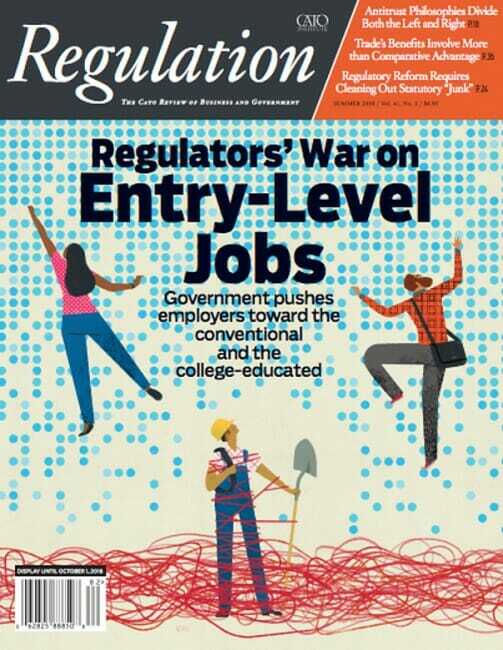 I wrote about this in the summer issue of Regulation magazine, in a article entitled "How Labor Regulation Harms Unskilled Labor." I argued that while likely intended to help the very poor, most labor regulation may be harming the poor, particularly those without skills or much experience, by making it harder and harder for them to find work. This not only impoverishes them, but makes it harder for them to progress to better jobs and higher income levels. In my business,which staffs and operates public campgrounds, I employ about 350 people in unskilled labor positions, most at wages close to the minimum wage. I had perhaps 40 job openings last year and over 25,000 applications for those jobs. I am flooded with people begging to work and I have many people asking for our services. But I have turned away customers and cut back on operations in certain states like California. Why? Because labor regulation is making it almost impossible to run a profitable, innovative business based on unskilled labor. Why is this important? Why can’t everyone just go to college and be a programmer at Google? Higher education has indeed been one path by which people gain skills and opportunity, but until recently it has never been the most common. Most skilled workers started as unskilled workers and gained their skills through work. But this work-based learning and advancement path is broken without that initial unskilled job. For people unwilling, unable, or unsuited to college, the loss of unskilled work removes the only route to prosperity. ...the mass of government labor regulation is making it harder and harder to create profitable business models that employ unskilled labor. For those without the interest or ability to get a college degree, the avoidance of the unskilled by employers is undermining those workers’ bridge to future success, both in this generation and the next. Public policy could best help the poor by lowering the regulatory barriers to hiring unskilled labor and promoting economic growth that will help keep us close to full employment. Part 1 of this series was here. In their latest paper, which has not been formally peer reviewed, Mr. Vigdor and his colleagues considered how the minimum-wage increases affected three broad groups: People in low-wage jobs who worked the most during the nine months leading up to and including the quarter in which the increase took effect (more than about 600 or 700 hours, depending on the year); people who worked less during that nine-month period (fewer than 600 or 700 hours); and people who didn’t work at all and hadn’t during several previous years, but might later work. The latter were potential “new entrants” to the ranks of the employed, in the authors’ words. The workers who worked the most ahead of the minimum-wage increase appeared to do the best. They saw a significant increase in their wages and only a small percentage decrease in their hours, leading to a healthy bump in overall pay — an average of $84 a month for the nine months that followed the 2016 minimum-wage increase. It’s the final group of workers — the potential new entrants who were not employed at the time of the first minimum-wage increase — that Mr. Vigdor and his colleagues believe fared the worst. They note that, at the time of the first increase, the growth rate in new workers in Seattle making less than $15 an hour flattened out and was lagging behind the growth rate in new workers making less than $15 outside Seattle’s county. This suggests that the minimum wage had priced some workers out of the labor market, according to the authors. 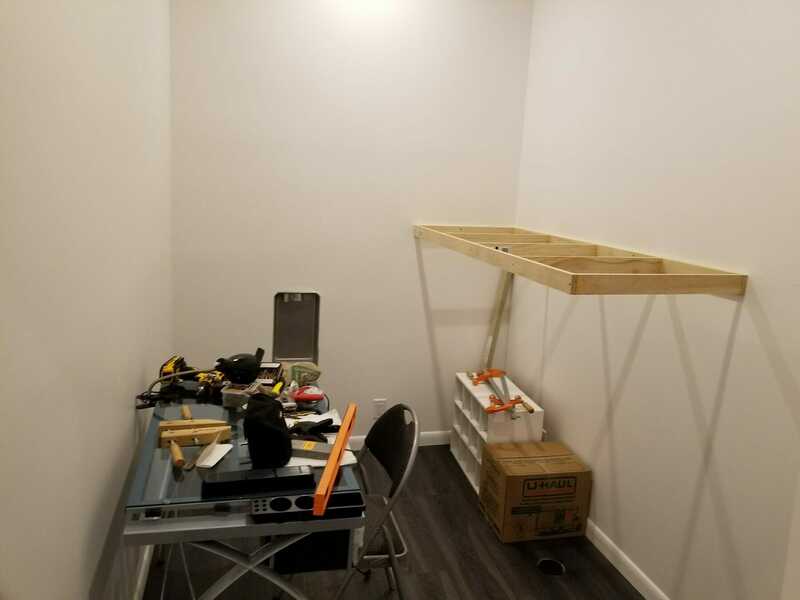 “For folks trying to get a job with no prior experience, it might have been worth hiring and training them when the going rate for them was $10 an hour,” Mr. Vigdor speculated, but perhaps not at $13 an hour. I would add as an aside that I think the NYT is being a bit arrogant an narrowly focused on money (vs. other benefits of employment) when they added the parenthetical phrase at the end of the third paragraph. From the recently released study, "The Unintended Consequences of 'Ban the Box': Statistical Discrimination and Employment Outcomes When Criminal Histories Are Hidden"
Jurisdictions across the United States have adopted “ban the box” (BTB) policies preventing employers from asking about job applicants’ criminal records until late in the hiring process. Their goal is to improve employment outcomes for those with criminal records, with a secondary goal of reducing racial disparities in employment. However, removing criminal history information could increase statistical discrimination against demographic groups that include more ex-offenders. We use variation in the timing of BTB policies to test BTB’s effects on employment. We find that BTB policies decrease the probability of employment by 3.4 percentage points (5.1%) for young, low-skilled black men. employee rises, regulations are making it harder to get good information to make better hiring choices,while simultaneously making it harder to terminate employees who were poorly chosen and present threats to the workplace or customers. When employers begin to look at their employees not as valuable assets but as potential liabilities, fewer people are going to be hired. One potential way employers can manage this risk is to shift their hiring from unskilled employees to college graduates. Consider the risk of an employee making a racist or sexist statement to a customer or coworker (and in the process creating a large potential liability for the company). Almost any college graduate will have been steeped in racial and gender sensitivity messages for four years, while an employer might have an hour or two of training on these topics for unskilled workers. Similarly, because good information on prospective employees—credit checks, background checks,reference checks, discussions of past employment and salary—all have new legal limitations, employers who hire college graduates benefit from the substantial due diligence universities perform in their admissions process. I made a vow a while back to try to get better at appealing to progressives using their assumptions, not mine. So here is my shot at it here. Prejudice exists among some employers that hold a stereotype of African-Americans as disproportionately criminal. The best way to fight prejudice is through information and education. But ban-the-box laws and other restrictions on background checks do just the opposite -- they restrict information. Employers who see full criminal record information, say for African-American applicants, will be struck by how few have criminal records. "Hey, these guys are OK," I can imagine someone saying. Without this information, all that the employer has to work with are his pre-existing prejudices and misinformation, and in that context he might avoid African-Americans thinking "they are probably all criminals." Most of us who took Econ 101 would expect that an increase in the minimum wage would increase unemployment, at least among low-skilled and younger workers most affected by the minimum wage. After all, demand curves slope downwards so that an increase in price of labor should result in a decrease in demand for that labor. There is a great body of work on employment effects of minimum wage, and surveying this corpus is beyond the scope of this paper, but a good starting point might be the recent detailed and careful study by Jardim et. al. of the University of Washington, which analyzed the employment effects of the increase in minimum wages in Seattle from $11 to $13. They found that while average hourly wages for lower-paid workers went up by 3%, the total hours worked went down by 9%, resulting in a net reduction in total wages for lower-paid, lower-skill workers at the same time that other sectors of the Seattle economy were booming. Supporters of the minimum wage, however, argue that these employment effects are exaggerated, because employers have something called monopsony power when hiring low-skill workers. What a monopoly is to customers – it limits choices – a monopsony does to suppliers, in this case the suppliers of labor. The argument is that due to a bargaining power imbalance, employers can hire workers for less than they would be willing to pay in a truly competitive market, gaining the company added savings that increase its profits. Under this theory, minimum wage laws help to offset this power imbalance and force companies to disgorge some of their excess profits in favor of higher wages. If this assumption is true, then demand for labor would not be reduced due to a minimum wage increase because, prior to the wage increase, companies were paying less than they were willing to pay and thus are still willing to continue to pay the wages at the new higher rates. While economists argue about this monopsony theory, my intuition as an employer makes me skeptical. However, rather than argue about whether my little company that scrambles to staff itself every year somehow wields excess power in the labor markets, I am going to argue that the existence of monopsony power is irrelevant to the employment effects of a minimum wage increase: Even if companies are able to pay workers less than they might via such bargaining power imbalances, whatever gains they reap from workers will end up in consumer hands. As a result, minimum wage increases still must result either in employment reductions or consumer price increases or more likely both. Why? Well, we need to back up and do a bit of business theory. Just as macroeconomics (all the way back to Adam Smith) spends a lot of time thinking about why some countries are rich and some are poor, business theory spends a lot of time trying to figure out why some firms are profitable and some are not. One of the seminal works in this area was Michael Porter's Five Forces model, where he outlines five characteristics of markets and firms that tend to drive profitability. We won't go into them all, but the most important of the forces for us (and likely for Porter) is the threat of new entrants -- how easy or hard is it for new firms to enter the marketplace and begin competing against an incumbent firm? If new companies can enter into competition easily, a profitable firm will simply attract new competitors, and keep attracting them until the returns in that market are competed down to some minimum level. Let’s consider a company paying minimum wage to most of its employees. At least at current minimum wage levels, minimum wage employees will likely be in low-skill positions, ones that require little beyond a high school education. Almost by definition, firms that depend on low-skill workers to deliver their product or service have difficulty establishing barriers to competition. One can’t be doing anything particularly tricky or hard to copy relying on workers with limited skills. As soon as one firm demonstrates there is money to be made using low-skill workers in a certain way, it is far too easy to copy that model. As a result, most businesses that hire low-skill workers will have had their margins competed down to the lowest tolerable level. Firms that rely mainly on low-skill workers almost all have single digit profit margins probably averaging around 5% of revenues (for comparison, last year Microsoft had a pre-tax net income margin of over 23%). If there were some margin windfall to be obtained from labor market power that allowed a company to hire people for far less than their labor was worth to it, and thus earn well above this lowest tolerable margin, new companies would try to enter the market, probably by lowering prices to consumers using some of that labor premium. Eventually, even if the monopsony premium exists, it is given away to consumers in the form of lower prices. If the wholesale price of gasoline suddenly falls sharply, gasoline retailers don't get to earn a much higher margin, at least not for very long. Competition quickly causes the retailer's lowered costs to be passed on to consumers in the form of lower retail prices. The same goes for any lowering of labor costs due to monopsony power -- if such a windfall exists, it is quickly passed on to consumers. Raising prices to cover the increased costs. While competitors that are subject to the same laws will likely have similar increases, the increase may not be acceptable to consumers and almost certainly will result in some loss in unit sales. Exiting one or more businesses and laying everyone off. This may take the form of exiting a few selected low-margin lines of business, or liquidation of the entire company if the business is no longer viable with the higher labor costs. A concrete example should help. Imagine a service business that relies mainly on minimum wage employees in which wages and other labor related costs (payroll taxes, workers compensation, etc.) constitute about 50% of the company’s revenues. Imagine another 45% of company revenues going towards covering fixed costs, leaving 5% of revenues as profit. This is a very typical cost breakdown, and in fact is close to that of my own business. The 5% profit margin is likely the minimum required to support capital spending and to keep the owners of the company interested in retaining their investment in this business. Now, imagine that the required minimum wage rises from $10 to $15 (exactly the increase we are in the middle of in places like Seattle and California). This will, all things equal, increase our example company's total wage bill by 50%. With the higher minimum wage, the company will be paying not 50% but 75% of its revenues to wages. Fixed costs will still be 45% of revenues, so now profits have shifted from 5% of revenues to a loss of 20% of revenues. This is why I tell folks the math of supposedly absorbing the wage increase in profits is often not even close. Even if the company were to choose to become a non-profit charity outfit and work for no profit, barely a fifth of this minimum wage increase in this case could be absorbed. Something else has to give -- it is simply math. The absolute best case scenario for the business is that it can raise its prices 25% without any loss in volume. With this price increase, it will return to the same, minimum acceptable profit it was making before the regulation changed (profit in this case in absolute dollars -- the actual profit margin will be lowered to 4%). But note that this is a huge price increase. It is likely that some customers will stop buying, or buy less, at the new higher prices. If we assume the company loses 1% of unit volume for every 2% price increase, we find that the company now will have to raise prices 36% to stay even given both the minimum wage increase and the lost volume. Under this scenario, the company would lose 18% of its unit sales and is assumed to reduce employee hours by the same amount. In the short term, just for the company to survive, this minimum wage increase leads to a substantial price increase and a layoff of nearly 20% of the workers. Of course, in real life there are other choices. For example, rather than raise prices this much, companies may execute stealth price increases by laying off workers and reducing service levels for the same price (e.g. cleaning the bathroom less frequently in a restaurant). In the long-term, a 50% increase in wage rates will suddenly make a lot of labor-saving capital investments more viable, and companies will likely substitute capital for labor, reducing employment even further but keeping prices more stable for consumers. As you can see, in our example we don’t need to know anything about bargaining power and the fairness of wages. Simple math tells us that the typical low-margin service business that employs low-skill workers is going to have to respond with a combination of price increases and job reductions. Is Uber a taxi firm or a technology company, and are its drivers self-employed or mistreated employees? These questions are being asked of Uber the world over, and last year an employment tribunal case in the UK concluded two drivers were, in fact, entitled to minimum wage, holiday pay and other benefits. The ride-hailing service contested this potentially precedent-setting decision, as you'd expect, but today Uber lost its appeal. In other words, the appeal tribunal upheld the original ruling that drivers should be classed as workers rather than self-employed. The appeal tribunal agreed that when a driver is logged in and waiting for a job, that's still tantamount to "working time." Working time they aren't getting paid for, of course. Interestingly, the ruling also noted that Uber basically has a monopoly on private hire via an app. Therefore, drivers are beholden to them and can't reasonably engage in other work while also being at Uber's disposal. GMB, the union for professional drivers that's behind the original case, is calling it "a landmark victory." Naturally, the law firm representing the GMB and Uber drivers feels much the same. No points for guessing who has a slightly different opinion. Despite Engadget's usual economic ignorance that this must be all good for drivers, in fact this is going to destroy about everything that makes Uber attractive as compared to 9-5 office jobs. That is, if rulings like this don't kill the company entirely, as I have previously prophesied. This is going to add a new cost for Uber, forcing them to pay money to drivers for dead time when they are not actually driving a passenger. Let's make the reasonable assumption that Uber's first response to this is to A) stay in business and B) attempt to keep prices to customers from rising. The only way they can do this is to minimize dead time. Want to park at your house in an unpromising neighborhood with little business? Forget it, Uber can't allow that in the future. Want to work at an unproductive hour of your choosing? Forget it. Uber is going to have to set quotas on certain regions and hours of the day that are less productive and find a way to ban drivers from working those times. In addition, they are likely to institute some sort of productivity metric for drivers, ie something like revenue minutes as a percent of total, and then they are going to rank all the drivers and start cutting drivers from the bottom of the list. If Uber survives, it is going to be a very different company to work for, and is going to feel much more like a regular office job with a boss hanging around your cubicle pestering you about TPS reports. 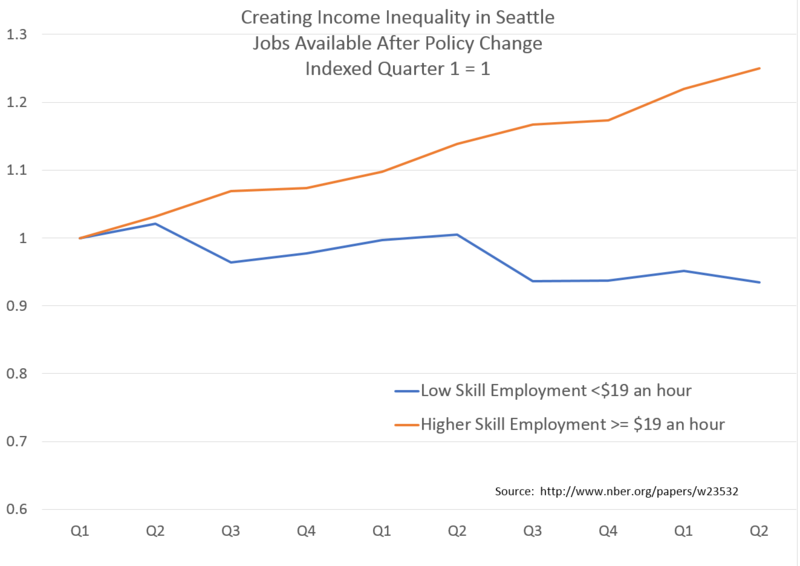 So Seattle made a public policy change that caused lower-skill, lower-wage employment to lag way behind employment of wealthier, higher-skill folks. How is it possible to write over 1300 words on the disapearance of teenage summer jobs without once mentioning the minimum wage? Two of the most substantial criticisms of the minimum wage are 1. it prices low-skilled workers out of the market (and there is no one more unskilled than an inexperienced teenager) and 2. it put 100% emphasis on pay as the only reward for work, while giving no credit for things like gaining valuable experience and skills. We clearly see both at work here, and it is likely no coincidence that we are seeing this article in the same year minimum wages went up by 25% in AZ, as they have in many other states. By the way, in addition to the minimum wage, AZ (as has many other states) has established all sorts of laws to "protect" underrage workers by adding all sorts of special work rules and tracking requirements. In our business, which is a summer recreation business, we used to hire a lot of teenagers. Now we have a policy banning the hiring of them -- they are too expensive, they create too much liability, and the rules for their employment are too restrictive. Without evidence, he treats it entirely as a supply problem, ie that teens are busy and are not looking for work. But the data do not support this. 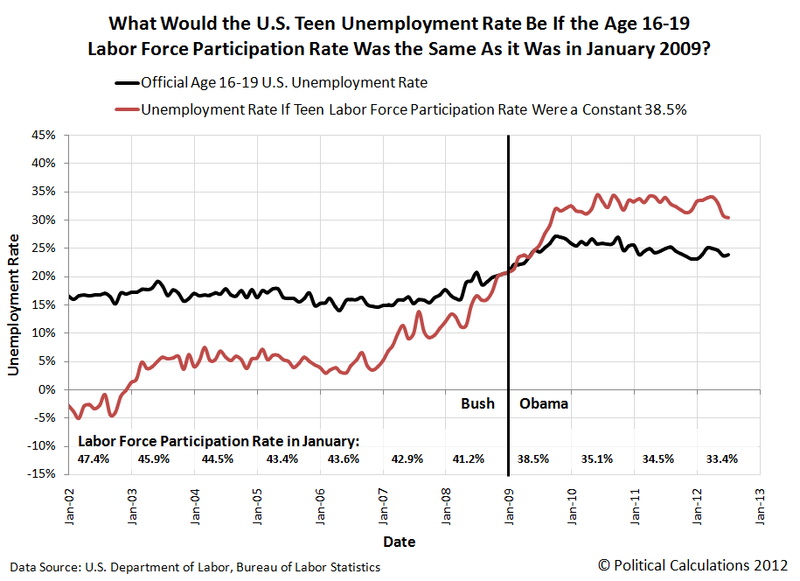 The teen unemployment rate, defined as employment by teens actively looking for work, is up. The workforce participation rate for teens is down, but the author has nothing but anecdotal evidence that this is a supply rather than a demand issue. It could be because teens are busier or buried in their cell phones or whatever or it could be because they have given up looking for work. Most of us who took Econ 101 would expect that an increase in the minimum wage would increase unemployment, at least among low-skilled and younger workers. After all, demand curves slope downards so that an increase in price of labor should result in a decrease in demand for that labor. Supporters of the minimum wage, however, argue that employers have monopsony power when hiring low-skill workers. What they mean by this is that due to a bargaining power imbalance, employers can hire workers for less than they would be willing to pay in a truly competitive market. As the theory goes, this in turn creates an additional consumer surplus for employers, which manifests itself as higher profits. A minimum wage increase would thus reduce this surplus but not effect employment because companies before the new minimum wage were paying less than they were willing to pay. Thus minimum wage supporters argue that higher wages mandated by minimum wage laws will be paid out of these excess profits, and not result in higher prices or less employment. My understanding (and I am not an economist) is that the evidence for monopsony power in hiring low-skill workers is weak or at best limited to niche circumstances. However, I am going to argue that it does not matter. 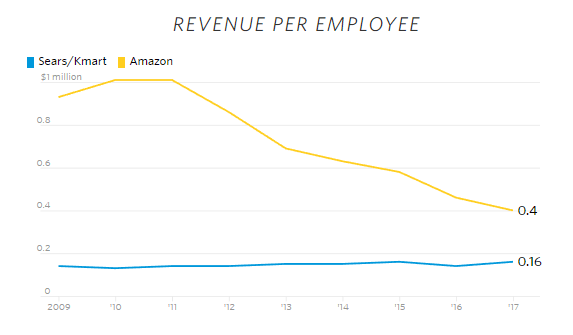 Even if companies are able to pay workers less than they might via such monopsony power, whatever gains they reap from workers ends up in consumer hands. As a result, minimum wage increases still must result either in employment reductions or consumer price increases or more likely both. Why? Well, we need to back up and do a bit of business theory. Just as macroeconomics (all the way back to Adam Smith) spends a lot of time thinking about why some countries are rich and some are poor, business theory spends a lot of time trying to figure out why some firms are profitable and some are not. One of the seminal works in this area was Michael Porter's Five Forces model, where he outlines five characteristics of markets and firms that tend to drive profitability. We won't go into them all, but the most important for us (and likely for Porter) is the threat of new entrants -- how easy or hard is it for new firms to enter the marketplace and begin competing against an incumbent firm. If new companies can enter into competition easily, a profitable firm will simply attract new competitors, and keep attracting them until the returns in that market are competed down. So let's consider a company paying minimum wage to most of its employees. At least at current minimum wage levels, minimum wage employees will likely be in low-skill positions, ones that require little beyond a high school education. Almost by definition, firms that depend on low-skill workers to deliver their product or service have difficulty establishing barriers to competition. One can’t be doing anything particularly tricky or hard to copy relying on workers with limited skills. As soon as one firm demonstrates there is money to be made using low-skill workers in a certain way, it is far too easy to copy that model. As a result, most businesses that hire low-skill workers will have had their margins competed down to the lowest tolerable level. Firms that rely mainly on low-skill workers almost all have single digit profit margins (net income divided by revenues) -- for comparison, last year Microsoft had a pre-tax net income margin of over 23%. Exiting one or more businesses and laying everyone off. This may take the form of targeted exits from low-margin lines of business, or liquidation of the entire company if the business Is no longer viable with the higher labor costs. When I discuss this with folks, they will say that the increase could still come out of profitability -- a 5% margin could be reduced to 3% say. When I get comments like this, it makes me realize that people don't understand the basic economics of a service firm, so a concrete example should help. Imagine a service business that relies mainly on minimum wage employees in which wages and other labor related costs (payroll taxes, workers compensation, etc) constitute about 50% of the company’s revenues. Imagine another 45% of company revenues going towards covering fixed costs, leaving 5% of revenues as profit. This is a very typical cost breakdown, and in fact is close to that of my own business. The 5% profit margin is likely the minimum required to support capital spending and to keep the owners of the company interested in retaining their investment in this business. Now, imagine that the required minimum wage rises from $10 to $15 (exactly the increase we are in the middle of in California). This will, all things equal, increase our example company's total wage bill by 50%. With the higher minimum wage, the company will be paying not 50% but 75% of its revenues to wages. Fixed costs will still be 45% of revenues, so now profits have shifted from 5% of revenues to a loss of 20% of revenues. This is why I tell folks the math of absorbing the wage increase in profits is often not even close. Even if the company were to choose to become a non-profit charity outfit and work for no profit, barely a fifth of this minimum wage increase in this case could be absorbed. Something else has to give -- it is simply math. The absolute best case scenario for the business is that it can raise its prices 25% without any loss in volume. With this price increase, it will return to the same, minimum acceptable profit it was making before the regulation changed (profit in this case in absolute dollars -- the actual profit margin will be lowered to 4%). But note that this is a huge price increase. It is likely that some customers will stop buying, or buy less, at the new higher prices. If we assume the company loses 1% of unit volume for every 2% price increase, we find that the company now will have to raise prices 36% to stay even both of the minimum wage increase and lost volume. Under this scenario, the company would lose 18% of its unit sales and is assumed to reduce employee hours by the same amount. In the short term, just for the company to survive, this minimum wage increase leads to a substantial price increase and a layoff of nearly 20% of the workers. Of course, in real life there are other choices. For example, rather than raise prices this much, companies may execute stealth price increases by laying off workers and reducing service levels for the same price (e.g. cleaning the bathroom less frequently in a restaurant). In the long-term, a 50% increase in wage rates will suddenly make a lot of labor-saving capital investments more viable, and companies will likely substitute capital for labor, reducing employment even further but keeping prices more stable for consumers. In bidding these, we bid both the camping fee we will charge to customers as well as the rent we will pay to the government for the concession. Given the weights the government uses in the bid process, keeping customer price low is more important than the rent we pay, so in most cases the prices we charge customers are well below the private market rate for similar campgrounds. We have limited ability to further increase productivity, in part because our ability to invest in these campgrounds in limited. In places where we are under the market price, we have been able to raise prices without a lot of drop in volume. But this means that our camping rates in some locations have risen from $18 to a future $26 a night, an enormous increase in just a few years. In places where we did not think the market would bear such a rate increase, or where our contract did not allow such a rate increase, we closed our operation. In fact, we have exited about half our business in California (while simultaneously growing it aggressively in states like Tennessee). In all cases this has resulted in a loss of employment -- either the location was never reopened by anyone else, or else it was reopened by a competitor with different reputational concerns who staffed the location with far fewer employees. It appears that the ballot initiative for a higher Arizona minimum wage is going to pass, raising minimum wages as early as January, 2017 from $8.05 to $10.00. This is an increase of 24%, and comes on very short notice. Currently, about half of our total costs are tied to wage rates (both payroll taxes and workers compensation insurance premiums are directly tied to wages and go up automatically by the same amount wages go up). Because of this, a 24% increase in wage rates will result in our costs going up on average by 12%. It had been my intention to keep fees to customers flat in 2017, but that is now impossible in Arizona. This 12% expense increase is about twice the amount of profit we make -- there is no way we can absorb it without a fee increase. I apologize for the late notice, but I have never, ever had a minimum wage increase imposed on such short notice. We will have to look at our financials for each permit, but my guess is that on average, we are talking about camping fee increases of $2 and day use fee increases of $1. This range of fee increases will actually not cover our full cost increase, but we will try to make up the rest with some reductions in employee hours. This is a regular chart used by Mark Perry, updated for the most recent data. It is one of my favorites. Mark has a lot of great analysis of this data, too long to excerpt, so I refer you back to the link to see his comments. But I want to add one of my own. Let me restate the numbers in this chart one other way to give a pretty stark view of utility of raising the minimum wage as a poverty program. Let's look at the first lowest vs. the second lowest quintile. 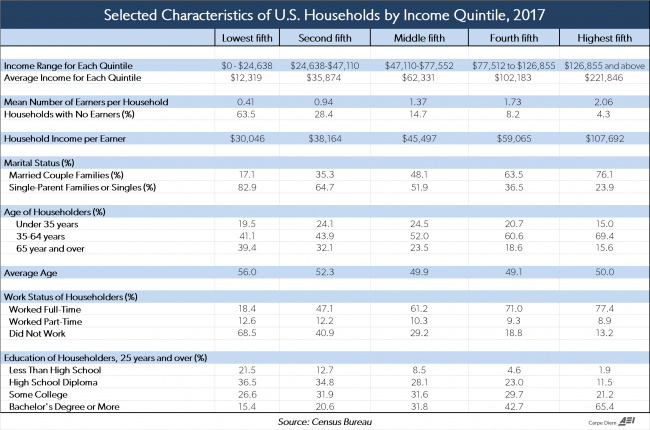 Raising current workers in the poorest quintile to second quintile earnings ($28,970 to $35,858) would increase the first quintile's average income by $2,962. On the other hand, keeping first income wages flat but raising first quintile household's average earners to second quintile number of earners (0.43 to 0.91) increases the first quintile's average income by $13,905. By this analysis, increasing first quintile hours worked (and % employment) has 4.7 times more leverage than fiddling with wage rates. So now consider raising the minimum wage, which will raise some wages but reduce unskilled employment -- it is exactly the wrong thing to do, even before we consider that the majority of minimum wage earners who benefit from such an increase and keep their jobs are not in the lowest quintile but are 2nd and third earners in rich and middle class households. BLM: OK, You Have Our Attention -- and Many of Us Are Sympathetic -- What in the Hell Do You Want Done? Well, it appears that Black Lives Matters has moved on to climate activism, or whatever, but has mostly fallen off message on police accountability. Protests in the vague hope of ending racism by closing busy highways and airports and kneeling during the National Anthem are going to get nothing done -- the solution to the problems that sparked the BLM movement are to be found in legislative efforts to create better police accountability measures and to roll back a number of egregious protections from accountability that exist in many union contracts. The solution is not to throw blanket hate on police officers, many or most of whom are doing a good job, but to recognize that when we give officers unique powers to use force, they need extra accountability to go with those powers. Today, most police have less accountability for their use of force than you and I do. Unfortunately, doing that is hard. It is a tough legislative slog that has to go local city by local city, with few national-level shortcuts available. It faces opposition from Conservatives who tend to fetishize police, and from Liberals who are reluctant to challenge a public employees union. And it requires that BLM translate their energy from disruption and attention-grabbing (which they are very good at) to policy and legislation, which they have shown no facility for. They need to be working on model legislation and pushing that down to the local level. This original plan actually looked pretty good, but apparently it has been rejected and gets little or no attention. As a result, BLM seems to be stuck in a pointless do-loop of disruption and virtue-signalling. I just want to scream at them, "OK, you have our attention -- and many of us are sympathetic -- what in the hell do you want done?" Unfortunately, their current lists of goals have almost nothing to do with police accountability and appear to be a laundry list of progressive talking points. It appears to be another radical organization that has been jacked by the Democratic establishment to push mainstream Democratic talking points. Here is a good example, for a number of reasons. In the past, the officer likely would have been believed and the woman might have been convicted of something. I think this happens to people across the racial spectrum, but African-Americans have had a particularly hard time -- given both racist perceptions and lack of good counsel -- in these he-said-she-said cases with police. Not to mention that African-Americans -- for a variety of reasons including racial profiling in things like New York's stop and frisk program to the tendency of poor black municipalities to fine the crap out of their citizens to generate revenue -- come in contact with police disproportionately more often. Legalize drugs. This would reduce the rents that attract the poor into dealing, would keep people out of jail, and reduce a lot of violent crime associated with narcotics traffic that kills investment and business creation in black neighborhoods. It would also reduce the main excuse for petty harassment by police that falls disproportionately on young black men. No it's not a good thing to have people addicted to strong narcotics but it is worse to be putting them in jail and having them shooting at each other. Bring real accountability to police forces. When I see stories of folks absurdly abused by police forces, I can almost always guess the race of the victim in advance. I used to be a law-and-order Conservative that blindly trusted police statements about every encounter. The advent of cell-phone video has proven this to be supremely naive. No matter how trusted, you can't give any group a pass on accountability. Voucherize education. It's not the middle class that is primarily the victim of awful public schools, it is poor blacks. Middle and upper class parents have the political pull to get accountability. It is no coincidence the best public schools are generally in middle and upper class neighborhoods. Programs such as the one in DC that used to allow urban poor to escape failing schools need to be promoted. I am simply exhausted with the notion that seems to have taken over both political parties that trade with China is somehow the source of US economic woes. Remember that voluntary trade can't happen unless both parties are benefiting from each trade. Remember the masses of academic evidence that the (largely hard to see) benefits of trade in terms of lower costs and more choice tend to be greater than the (easier to see) job losses in a few trade-affected industries. But even if none of that is compelling to you, consider that our trade deficit with China is just 2% of GDP. It's almost a rounding error. payroll taxes that act as sales taxes on labor -- we understand that cigarette taxes are supposed to reduce cigarette purchases but don't understand that payroll taxes reduce purchases of labor? And this is just employment law -- we could go on all day with regulations that make life difficult for lower income workers, such as the numerous laws that restrict the housing stock and drive up housing prices and rents for these same folks who are struggling to find a job. Let's say you live in California. Who has killed more jobs in your state -- China or the California legislature? The answer is no contest. The California legislature wins the job destruction race in a landslide. While California's high-tech community enjoys a symbiotic relationship with China that has created immense wealth, the California legislature works overtime to make sure low-skilled workers in the state don't benefit. **Postscript: Of all the factors here, I won't say that this is the largest but I think it is the most underrated and least discussed. But think about it. If you are going to be personally financially libel for ignorant, insensitive, or uncouth remarks made by your employees, even when you have explicitly banned such behavior in company rules and don't personally tolerate it, how likely are you going to be to hire a high school dropout without a good work history to interact with customers? Beyond the basic lunacy of attempting to help the poor by mandating that they sell their labor for more than most businesses are willing to pay, I am reminded of another problem with proposals for a higher national minimum wage. This problem is related to one that is seldom discussed in the context of most economic statistics, and that is the differences in the cost of living in different parts of the country. 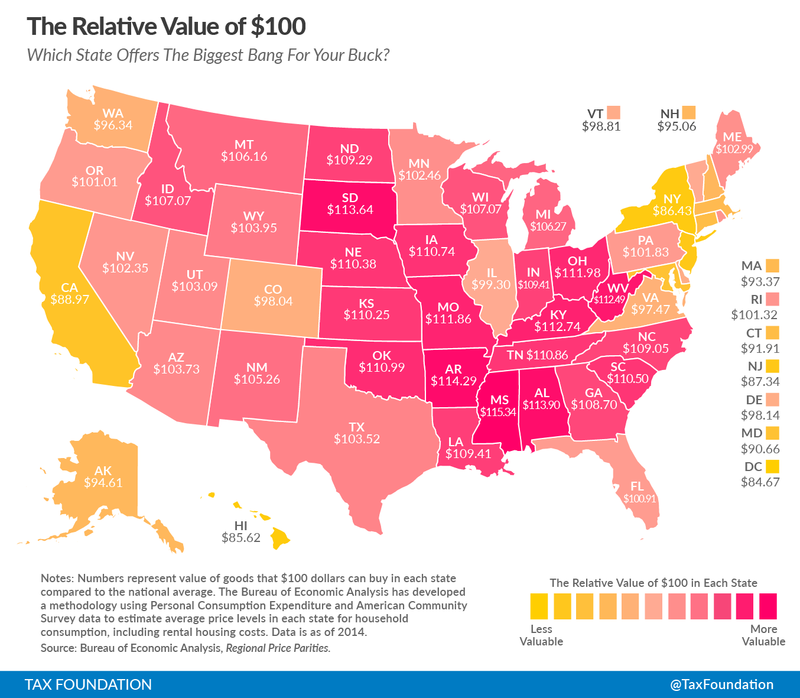 The Tax Foundation looks at the cost of living by state, showing the value of $100 ($100 is worth more in states with lower prices and cost of living, since one's money will go further). Magenta states are lower cost of living, yellow states are higher. I have written before that not taking this into account messes up our view of things like poverty and income by state. Well-being of folks in high cost states like California and New York are often exaggerated, as is poverty in states like those in the deep south. But another issue is that this large variation in cost of living changes the effective value of a minimum wage. Based on these numbers, a $15 minimum wage in Washington DC becomes, effectively, a $20.43 minimum wage in Mississippi. Employment effects are likely to be much worse in these lower costs states. Since the higher cost states all vote Democrat in Presidential elections, and the lower cost states all vote Republican, one wonders if this is a bug or a feature of Democrat-proposed $15 minimum wage plans. The city of Seatac (a small area of land around the Seattle-Tacoma Airport) gained national attention a while back for passing a $15 minimum wage. Many other groups, including the city of Seattle itself, as well as this year's Democratic platform committee, cited the Seatac example as an impetus for higher minimum wages everywhere. In today's politics, there is no better way for a Leftish politician to virtue-signal than to advocate for a $15 minimum wage. It is a classic case of a government law that helps a few easy to identify people and hurts a whole bunch of people in ways that are hard to attribute to the law, such as reduced employment for low-skill workers and higher prices for consumers. A three-month-long civil trial revealed the shadowy subterfuge behind a secret land grab that was orchestrated by the city of SeaTac, replete with backroom deals, baldfaced deceptions, and a mayor intent on driving Somali refugees from the neighborhood. The aim of it all: to wrestle 4.23 acres of prime real estate from entrepreneurs Gerry and Kathy Kingen, according to the judge and jury who heard the case. The West Seattle couple sued the city and won, proving in court that SeaTac officials intentionally sabotaged their development plans, strong-armed them into giving up their property and then violated the state’s Public Records Act by withholding city emails and documents proving the deception. In March 2004, K&S Developments [the Kingen's investment vehicle] began working with SeaTac’s planning department to get approval for [a] park-and-fly, and city officials “voiced support and encouragement” for the proposal. The judge noted there “was never any public opposition” to the plan. But unbeknown to the Kingens, SeaTac’s planning director, city manager and other staff decided in late 2005 they didn’t want K&S to build the park-and-fly because it would create competition for a park-and-fly the city wanted to build about a mile south at South 176th Street. James Bessen has a terrific article in the Harvard Business Review on the estimated contribution to corporate profits of rent-seeking, or the acquisition of special favors, subsidies, and protections from the government that shelter a company from the normal competition of a free market. Bessen argues that such rent-seeking is major explanatory factor for recent rises in corporate profits. This topic will be a familiar one to Coyoteblog readers. Show me a regulation and I will show you the large corporation that is able to use it to throttle competition. I remember when everyone claimed the retail minimum wage was going to hurt Wal-Mart, but in fact Wal-Mart actually supported it because it was paying a higher wage than its smaller upstart competitors and thus the minimum wage would tend to hurt Wal-Mart's competition worse than it would be hurt. Taxi service is one of the most regulated businesses in the country (at least in relation to the complexity of the business) and we are seeing just how much these regulations have supported taxi profits as we watch the taxi companies use the regulations to try to hammer Uber and Lyft. The pattern around the 1992 Cable Act is representative: I find that firms experiencing major regulatory change see their valuations rise 12% compared to closely matched control groups. Smaller regulatory changes are also associated with a subsequent rise in firm market values and profits. This research supports the view that political rent seeking is responsible for a significant portion of the rise in profits. Firms influence the legislative and regulatory process and they engage in a wide range of activity to profit from regulatory changes, with significant success. Without further research, we cannot say for sure whether this activity is making the economy less dynamic and more unequal, but the magnitude of this effect certainly heightens those concerns. Two characteristics make these changes particularly worrisome. 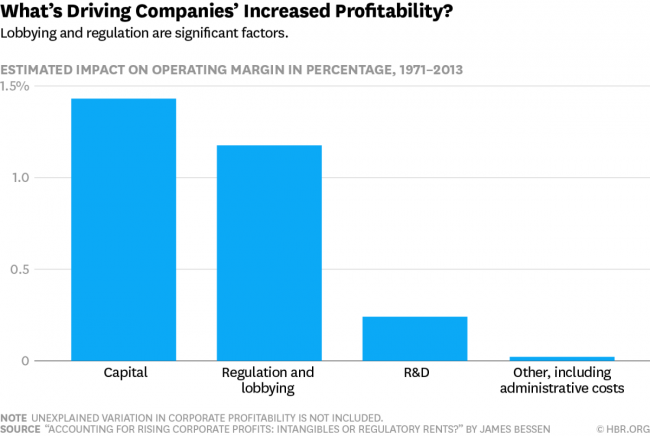 First, the link between regulation and profits is highly concentrated in a small number of politically influential industries. Among non-financial corporations, most of the effect is accounted for by just five industries: pharmaceuticals/chemicals, petroleum refining, transportation equipment/defense, utilities, and communications. These industries comprise, in effect, a ârent seeking sector.â Concentration of political influence among a narrow group of firms means that those firms may skew policy for the entire economy. For example, the pharmaceutical industry has actively stymied efforts to address problems of patent trolls that affect many other industries. I would add two other industries to this list -- medicine and legal. The reason it likely does not show up in his study is that the returns in these businesses show up to individuals or small private firms. But heavy regulation, and in particular a licensing process wherein one must get permission from the incumbents in order to compete with them, has always kept prices and returns in these businesses artificially high. Note by the way that the breakpoint year of 2000 makes this a bipartisan issue, occurring in equal measure in Republican and Democratic Congresses and Presidencies. The authors are above not doing economics, properly speaking. Instead, they offer business advice – or, rather, present themselves as possessing knowledge and information that is salable as business advice. The authors write as if they are management or business-operations consultants rather than economists. Pollin and Wicks-Lim here implicitly assert that their information on the details the state of the market and their knowledge of the particulars of how to run actual, real-world businesses are so real, full, and trustworthy that we should accept their conclusion that higher minimum wages will not cause businesses to change their operations in ways that result in fewer hours of paid work for low-skilled workers. Indeed, the trust that we are asked to put in Pollin’s and Wicks-Lim’s alleged business acumen is so high that we are supposed to accept their conclusions as justification to unleash the force of the state to alter the actual, real-world business decisions of actual, real-world people who are actually operating – with their own actual money – in actual, real-world markets. I can't see how the assumption of turnover reduction is consistent with the assumptions made by pro-minimum wage folks. There are two possibilities. First, assume the turnover is due to employees moving on at their own choice, presumably for a better deal. But how is this consistent with the frequent assumption of monopsony and that employees have no bargaining power? If employees are imposing high turnover costs on employers and frequently shifting jobs for better deals, there can't be a monopsony. It would mean that folks are taking these jobs for a short period of time to gain job skills and experience, and then moving to higher-skilled, better paying jobs, exactly how things should work in a free market without an absurdly high price floor on wages (I remember the old stat form the 80's that 10% of all Fortune 500 CEOs had their first job at McDonald's). OK, assume the other possibility that the turnover is due to the employer choices, that all the employees they hire are unacceptable because their skills or demeanor or productivity is insufficient in some way. Well if they were unacceptable at $7, how are they suddenly going to be acceptable at $15? Proponents seem to assume some magic occurs when one raises wages, that unskilled employees who can't show up on time will suddenly become attentive and skilled. In my experience, it never happens. For the record, given our 50% wage costs (and costs tied to wages like payroll taxes), we have had to increase prices 10% for every 20% increase in the minimum wage, and even then we have seen our profits fall, as we never see the magic productivity increase that is supposed to come with suddenly paying the same people higher wages and at the same time we do see a drop in customer demand due to the higher prices, which reduces our fixed cost coverage. This post earlier on the customer service downsides of the new salaried overtime rules got me thinking more broadly about the impact of minimum wage type laws. Progressives justify such laws by saying that there is a power imbalance between management and employees, and that the government needs to have minimum wage laws to make up for the fact that employees lack power. But from my experience in the service world, it is wrong to look at the situation as a power struggle between managers and employees. It is much more correct to look at this as a power struggle between employees and customers. Let me explain. Service and retail firms tend to live on razor-thin margins. Retailers typically live on single-digit profit margins, and those of companies like Wal-Mart are as low as 2% of revenues. Our company in the service business has a similar experience, averaging profit margins of 3-5% of revenues over the last 10 years. This is not an accident. Most service and retail businesses depend on simple service-delivery models using relatively low-skilled workers. There are many low-skilled workers in the world. If a company were to start making huge profits with a service model using such workers, it would be easy for others to copy it and hire the same types of workers and undercut them on price. Margins tend to get competed down to the bare minimum. No matter how much progressives would like it to be so, when California raises its minimum wage, it probably is not going to come out of company margins, at least in the near term. Over the 10 years from about 2013 to 2022, California will have raised its minimum wage over 87% from $8 an hour to $15. Wages and costs like workers comp premiums that are tied to wages are about half my costs. This means an 87% labor cost increase will increase my total costs 44%. How is that going to come out of a 4% margin? It is not. There are really only two things we can do, individually or in combination. First, we can raise prices 44%, just to try to stay even. Of course, some customers will balk and stop buying, and then we will lose business and perhaps have to close (we have already closed over half our businesses in California for just this reason). Or second, we could cut staff in half to keep wages under control. Of course, this means customers get served much more poorly, which also may drive customers away. Other companies like fast food restaurants have a third option of automation, replacing people with machines -- I wish we could do this but right now we have run out of ideas for automating bathroom cleaning and landscape work. Hopefully, you can see what is going on here. The real tension here is between employees and customers. When the state mandates a minimum wage in low margin service businesses (such laws are largely irrelevant to high-margin technology companies and such), compliance is paid for by the customer, either in the form of higher prices or worse service or both.